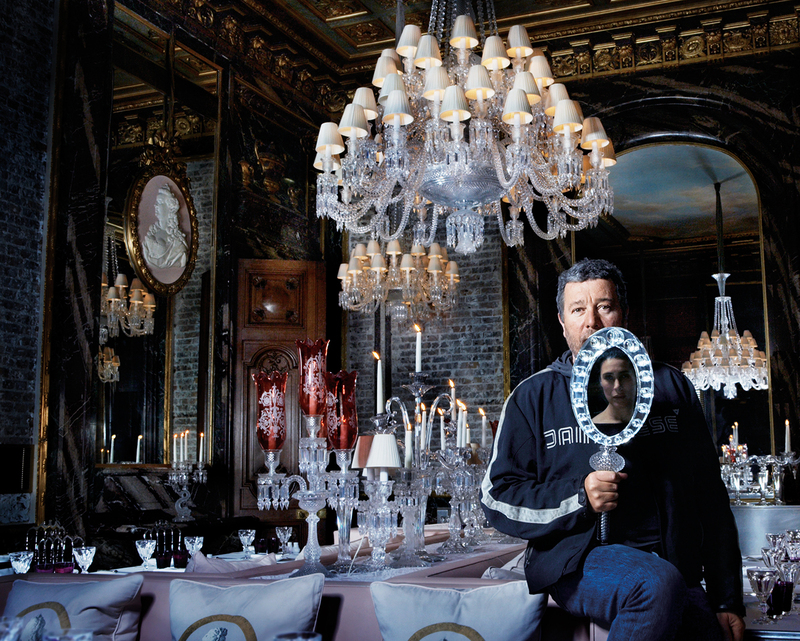 Philippe Starck in the Cristal Room at Maison Baccarat, Paris, with wife, Jasmine, in the mirror. Boutique at Maison Baccarat, Paris. Folie des Grandeurs, located in the gallery-museum at Maison Baccarat, Paris. 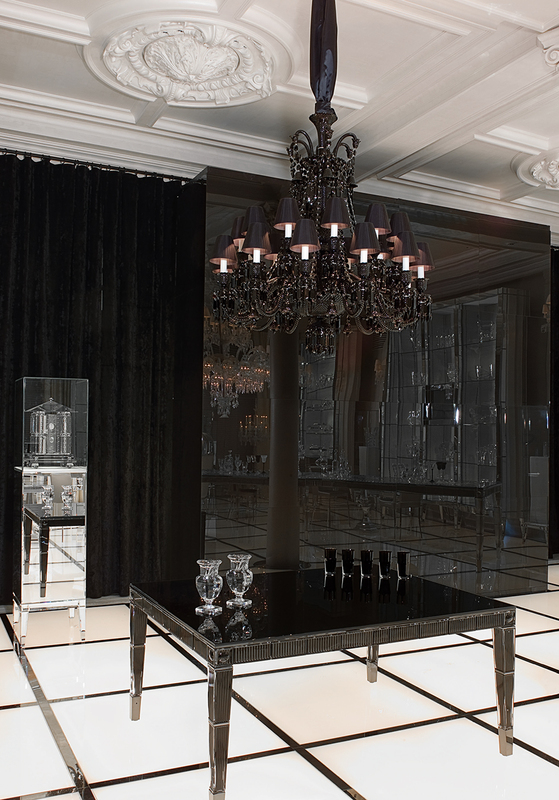 Boutique at Maison Baccarat, Moscow. The small room in Maison Baccarat in Paris has the clarity, silvery hues, and textural contrasts of a moonlit landscape. Winking with crystals, a huge chandelier hangs from the high ceiling, a classic except that, suspended by grey-satin-covered wire and invisibly motor-operated, it twists and turns almost imperceptibly, becoming something both magical and disquieting at the same time. An orderly row of small candlelit crystal lamps stands on a mirror-topped table, bouncing light off the translucent tops of slate-grey side chairs. From the raw concrete walls that still bear workmen’s drawings to the gunmetal gleam of satin upholstery, the space epitomizes the style of Philippe Starck, the French designer who has created a globally recognized visual language characterized by unexpected alliances of materials, organic lines, and simplicity. At one end of his Crystal Supper table is a high-backed, almost throne-like chair, and at the other is a chair with a carved black frame. And it’s here, not in the regal position, that Starck opts to sit, a suitably democratic place for someone who, throughout his working life, has focused on bringing good design to the average person. Democratically, too, everyone calls him Philippe, even though he is as, The Sunday Times once pointed out “the most celebrated designer in the world”. In a setting of crystal, it’s hard to avoid describing the protean Starck as multi-faceted. Besides creating sparkling interiors for Baccarat, he has put his mark on everything from eyewear to the Paris Eurostar terminal. His alphabet of design partnerships begins with A for Italian kitchenware firm Alessi and currently ends with Y for Yoo, the international property company he co-founded in 1999. All are the epitome of cool, even though, subversively, he has used garden gnomes as tables and guns as lamp bases. Starck does not play by anyone’s rules. Genial, crackling with energy, he is comfortable in jeans, trainers, a T-shirt, and a Dainese jacket; his cropped grey hair and beard are better suited to the role of off-duty chef or Dumas musketeer than to that of design visionary. Jasmine, his wife and communications director, is his sophisticated counterpart—black-clad, blade-slim, and with the grave amiable face of a Modigliani. “You must understand, I’ve never been interested by the final product,” says Starck. “I am not interested in a vase, a chandelier … The thing that always interests me is the essence, the spirit, the root, the square root, the structure of things.” And it’s what’s inside or behind crystal that intrigues him. “If one looks in the crystal, one sees aberrations, illusions, reflections that are, above all, mathematical,” he says, praising mathematics as “the most beautiful thing … the most beautiful poetry in the world”. Hyperactive, pyrotechnic, irreverent: you can apply any number of adjectives to Philippe Starck, but egotistical would not be on the list. He is a man who consistently thinks about what the average person needs. Born in 1949 to a father in aircraft engineering and a mother who, he says, “had panache”, his left brain/right brain upbringing led to design studies in Paris and to his own studio at the age of 19. By 1982, he was masterminding an apartment interior in the Élysée Palace for French President François Mitterand. In a parallel world, this skyward trajectory could have led to the rarified air of the exclusive and expensive. Starck, au contraire, wanted to “give the best to as many people as possible”. His designs have revolutionized the way we perceive objects. Consider his see-through Louis Ghost chair, his wireless iPod speakers, and food packaging that, even 20 years on, still appears fresh. A browse through the online archives at www.starck.com shows a vast diversity of projects but a consistent visual sensibility. In 1988, his work on Ian Schrager’s Royalton in New York inspired an entire genre: the boutique hotel. (Always ahead of the curve, Starck’s recently opened Mama Shelter in Paris ticks all the boxes, currently marked “cool style”, “nesting”, and “budget”.) What else has he done? What hasn’t he. Stylish bars and hotels in Hong Kong, villas in Thailand, faultlessly elegant bathroom fixtures, and a four-toys-in-one teddy bear. Shown beside multi-purpose food containers, unbleached cotton sheets, and other necessities, this offbeat plaything was in the Good Goods catalogue, which he produced in 1998, filled with “non-products for the non consumer of the next moral market”; Starck now feels it was too far ahead of its time. Given carte blanche, Philippe Starck immediately envisioned the Baccarat house as part storybook, part crystal palace, where every piece would have meaning. In Starck’s mind, improving others’ lives often involves recasting the mundane in a new light. Three now-cult examples: his curvaceous toothbrush from 1989, and the spider-like Juicy Salif lemon squeezer, and the Dr. Skud fly-swatter with its human face (“a far more ecological response than an insecticide spray”), both made for Alessi. The antithesis of a design snob, Starck also designed a line for the United States chain Target that included baby monitors and tape dispensers, objects viewed as commonplace—until he got his hands on them. Baccarat has never had its own art director, says Brigitte Bury, the company’s style and brand image vice president. Instead of responding to a single in-house vision, product development has been steered and artisanal know-how expanded by a multiplicity of talents, from Salvador Dalí to Jaime Hayon. For instance, “Sottsass says, ‘I want this,’ and workers have to figure out how,” explains Bury. 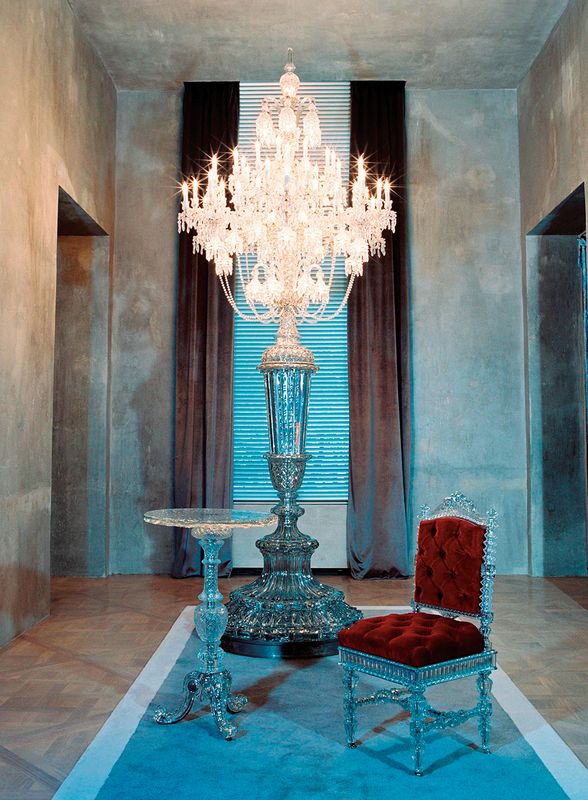 In 2003, Philippe Starck began producing what would become iconic and much-copied designs like the Dis Moi, Miroir and his Darkside collection which provoked the irreverent thought: Why shouldn’t a crystal chandelier be black? 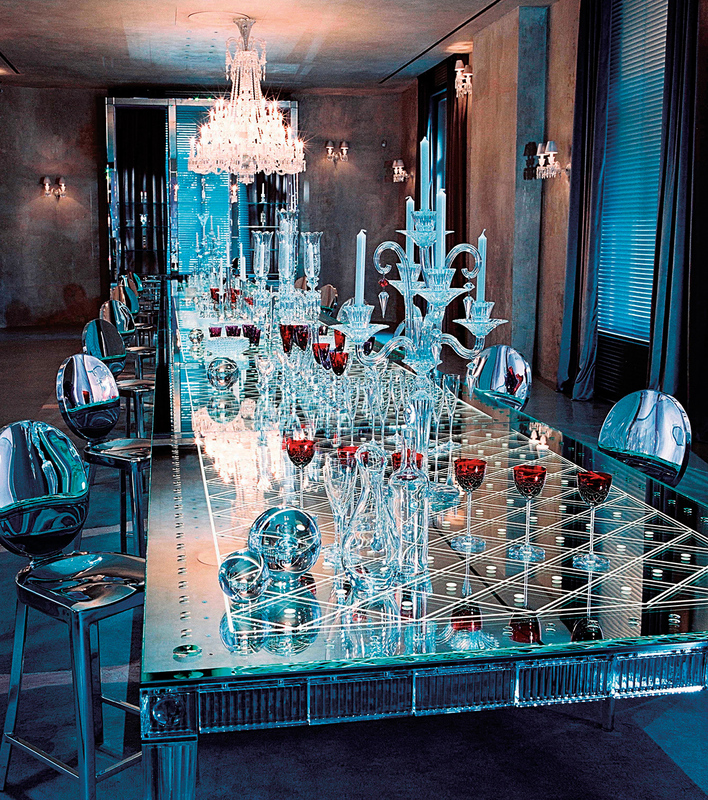 Visual wit, unexpectedness, élan: he brought them all to his biggest-ever project for Baccarat. Named after the village in north-east France where it is still based, the Baccarat company got its start in 1764 when Louis XV gave the Bishop of Metz the right to establish a glassworks. The first manufacturer in France to make crystal lighting fixtures and perfume bottles, it was soon creating luxurious housewares for kings, czars, and maharajahs, its travelling sales force bringing crystal to five continents. Today, Baccarat sells in 85 countries. From 1832 on, the company’s headquarters had been in rue Paradis, a Parisian street devoted to the art of living—but cars and delivery trucks quickly replaced horse-drawn carriages, and by the 21st century it was obviously time to move. “It is difficult to find places that have history and patrimony to go with the brand,” says Bury, calling the current location “really perfect for different reasons”. Just off the busy avenue d’Iéna, place des Etats-Unis is a peaceful enclave of embassies and law offices. The 3,000-square-metre hotel particulièr (private mansion) at number 11 already had an exceptional history when Baccarat took it over. By then, it had been empty for a decade but, from the 1920s on, the house had been home to the Vicomtesse Marie-Laure de Noailles, a renowned patron of the arts who, during her tenure, made it a social and cultural epicentre that drew artists, writers, filmmakers, and musicians—Cocteau, Dalí, Buñuel, and Kurt Weill among them. “That was the base,” says Starck, but dismayingly, the exquisite interior designed by Jean-Michel Frank had disappeared during redecoration by a subsequent owner. What remained was a house “ravagé par la vulgarité de l’argent,” says Starck. Know that argent means money and the phrase needs no translation. In number 11, place des Etats-Unis, Starck saw an opportunity “to create a new poetry … This place has an extraordinary history.” He compares the mansion to “a diamond in the ashes of Berlin. Crystalline perfection and destruction.” Starck’s job was to reclaim the diamond from the ashes. He began work in 2001 and finished the project two years later. 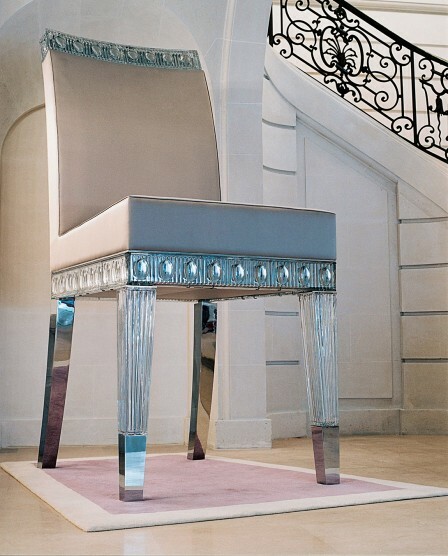 Giant crystal chair, Maison Baccarat, Paris. Crystal is a paradox: molten opaque matter becomes a transparent solid when touched by the magic wand of the glassblower’s pipe. A mixture of silica, lead oxide, and potassium metamorphoses into sparkling translucency. Pure alchemy. Given carte blanche, Philippe Starck immediately envisioned the Baccarat house as part storybook, part crystal palace, and all romantic and surreal, where every piece would have meaning. Leaving behind the reality of place des Etats-Unis, you enter a looking-glass world that immediately brings together crystal’s major elements. Twin mirror-framed fireplaces face each other across a central path of ancient tiles edged with concrete sidewalks. The wow factor abruptly escalates as, referencing the diffraction of light in a crystal, you come upon a chandelier immersed in a colossal aquarium. Visitors here can be struck by the sheer magic of the entrance without necessarily identifying the allusions, but understanding Starck’s subtle references does deepen the experience. To a child, he says, “It’s a fairytale.” A person who is not rich says, “It’s all my dreams of wealth.” To a cineaste, the entrance is a miniature film festival. Emerging from a three-metre-high mirror, a crystal arm supporting a lit globe evokes Jean Cocteau’s La Belle et la Bête. “Speaking” faces on an immense urn allude to his 1930 film The Blood of a Poet. What Starck did not design, he curated, choosing, for instance, a raw log bench that sprouts traditional chair backs, symbolizing the wood once used in crystal furnaces. Originally used for living and entertaining, the first floor (the second to North Americans) now houses the gallery-museum. Among the sampling from Baccarat’s 10,000-piece collection are an astonishingly modern jardinière from 1878 and a set of stemware made in 1947 to celebrate the marriage of chanteuse Josephine Baker. Nearby, Philippe Starck has transformed Marie-Laure de Noailles’s dining room into the Cristal Room, an airy restaurant where five chandeliers and a central bank of large candelabra shed light on vast settees upholstered in palest pink. Mirrors worthy of Versailles and a trompe l’oeil sky-painted ceiling provide grandeur—with a Starckian edge. Who else would have stripped the velvet and plaster from gold-framed recesses to bare the red brick beneath, or—in a nod to the classic bistro—installed a ceiling-high blackboard, or furnished the outdoor terrace with a huge mirror? In an adjacent private dining room, its walls veiled by translucent curtains, hangs Starck’s iconic black chandelier. Chandeliers illuminate everything at Maison Baccarat: a long line in the Passage des Lumières hints how particular styles might look in domestic settings. “I am very fascinated by chandeliers,” says Starck. When he looks at crystal, he also looks at its history. “I cannot disassociate my vision of a chandelier from the first man—in what era I do not know—who made an enormous fire in the desert, and in the morning … it had turned into a material that he had never seen before. Extraordinaire.” Now principally electrical, formerly candlelit, they are “the last element in modern life that has fire”. The element of fire was vital to Starck in the design of both this and the Maison Baccarat in Moscow which opened in 2008 in a mansion of the same vintage but considerably smaller. (Russian authorities weren’t amenable to the use of real fire in the restaurant decor, which inspired the incendiary designer to create a monumental ogre’s mouth full of vintage TV sets, all showing images of flames.) “In the 14th century, my family was Russian,” says Starck. In Paris, crystal is poetic and romantic, he says. In Moscow, it’s drama and passion. He talks of small waterfront villages like Pelestrina or Malamocco: “Sixty-metre-wide stretches of land planted with huts which emerge from the mist along with hairy dogs and people almost as hairy. I have a magnetic attraction for these ghostly places … On the island of Burano, you can feel a successful version of communism: all the houses are the same, people know each other for generations, they live on 800 metres, in the middle of the mud, the soupe primordiale.” He also lives “a bit” in Paris. “Actually I try to live as far as possible from cars,” he says, believing that the more cars, the less humanity. Even with spells of spiritual refreshment at isolated homes, his endless outpouring of new design suggests that where the average mind runs at dial-up speed, Starck’s functions on broadband. Where does he find the time? Not by chasing the limelight. “I always try to avoid following mainstream thinking,” he says, “I avoid following trends … I don’t read magazines, I don’t watch TV. I just read some books about biology, physics, and some good literature.” All of which, he believes, give him a broader perspective. Starck may not watch TV, but he is soon to appear on it. Scheduled to air this year in the U.K., the reality series Design for Life features a dozen young British designers competing for a work placement in his Paris design agency. Listen to Starck and you can easily figure out the personalities most likely to be voted out first. “There are several types of designers nowadays,” he says. “The venal one … who reflects marketing departments of big companies and whose objective is to make objects more beautiful in order for people to buy what they do not need. It is following [late industrial designer] Raymond Loewy: ‘ugliness does not sell’. This way of thinking is obsolete. In times of crisis, we cannot push people to buy more when they have no money. “The second type is the designer artist. To me, it is nonsense—they should choose what they are, whether they are artists or designers. The third category—the one I am part of—are the designers who see themselves as a maid with a broomstick and who want to help their community, to serve, to try to bring new solutions. They are closer to engineers. Their actions are politically orientated. And this is what new designers should be today, they should be out of the mainstream of thinking and go political, meaning, amongst other [things]: ecological. Not only mysterious but sparkling, scintillating, kaleidoscopic in short, magic, especially refracted through the prism of Starck’s imagination. Leading up from the entrance hall at Maison Baccarat, past the subaqueous chandelier, past a strange, dreamy mirror that reveals images of a man and a woman when viewed from different angles, and through tall doors to the right are broad red-carpeted steps. Here, far through the looking glass, the light is muted, the better to show the hundreds of tiny lights scattered like sequins in the carpet’s wide grey border. His inspiration? Eyes, sparkling. “From when you read a fairytale to children,” says Starck.